The Deluxe combo is full of creamy vintage American tone to match those good looks. Lots of subtle nuanced response. More headroom to make the most of those nuances. The trem could go faster. We wish that effects loop was footswitchable. 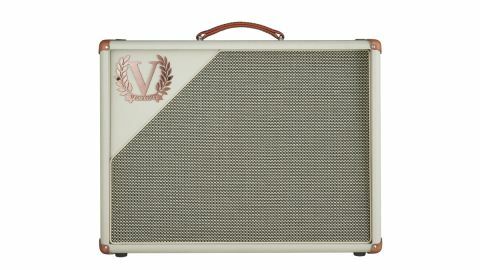 Victory’s British-made amp range continues to grow and generate lots of interest here and overseas, hardly surprising as its endorser list includes the phenomenal Guthrie Govan and Richie Kotzen. New off the release decks is the V40 Deluxe wide-body combo. It sits in Victory’s Heritage range, which means traditional wooden cabinet: our combo is in cream vinyl with tan leather corners and handle. Victory’s typically high build quality features heavy duty steel chassis supporting outsized Demeter transformers. Inside, the electronics are mostly contained on smart black printed circuit boards, with chunky Apem switches and metal film resistors used throughout for improved low noise performance. A large main board holds most preamp and power supply components, including the front panel controls and valve bases, with smaller boards for the in and out sockets, which all benefit from gold-plated contacts, while the power switches are chassis-mounted for reliability. The V40 Deluxe is essentially a revoiced adaptation of the existing V40 Duchess, with added tremolo and reverb. The controls are quite straightforward, with chickenhead knobs for drive, bass, mid, treble and master volume, plus speed and depth controls for the tremolo with level and tone controls for the valve-powered spring reverb. There are two small tone-altering mini toggle switches: Voice I/Voice II swaps between a ‘blackface’-type American EQ response and a slightly stronger midrange for more punch and drive, while Mid Kick is tied to the midrange pot and adds more focus. Five speaker outlets cover practically every impedance need, together with external bias test points and an adjustment screw, as well as a series effects loop with a bypass switch and a jack for the two-button footswitch, which toggles reverb and trem. There’s also a low power option switch that drops output from 42 watts down to around seven watts. A handy silkscreened info plate on the back panel makes it easy to tell where all the various sockets and switches are without having to turn either the amp or yourself upside down. We tried out this amp in studio and live band settings with a variety of guitars. The V40 Deluxe’s cream-on-cream colour scheme is a good clue to its warm, USA-inspired tones and smooth overdrive. The spring reverb adds an equally smooth halo that can be tweaked with its own tone control to add the right amount of warmth. The tremolo adds that Americana atmosphere, although like most vintage designs, the trem effect comes after the reverb, which is authentic but sounds a little odd if you’re expecting to hear things the other way around. On this sample, the effect’s lowest speed is okay, but we feel the high speed could be a little faster. Cranked up, the Deluxe sounds wonderful, although some of its subtle nuance tends to disappear when used with an averagely loud drummer. This is an impressive product. It’s relatively expensive for what’s on offer, but makes up for that by sounding great, albeit with a somewhat limited range.